MMP-11 is a member of the matrix metalloproteinase family (MMPs) which are overexpressed in cancer cells, stromal cells and the adjacent microenvironment. The MMP protein family encompasses zinc-dependent endopeptidases that degrade the extracellular matrix (ECM), facilitating the breakdown of the basal membrane and matrix connective tissues. This function is believed to be important in cancer development and metastasis. This paper investigated a gold nanoparticle-based immunohistochemical assay to visualise the distribution of MMP-11 in human breast cancer tissues from eight patients with and without metastases by employing laser ablation inductively coupled plasma mass spectrometry (LA-ICP-MS). The expression of MMP-11 was increased and more heterogeneous in metastatic specimens compared to non-metastatic tumour samples. These findings demonstrate that imaging breast tumours by LA-ICP-MS may be a useful tool to aid the prognosis and treatment of breast cancer. As an example, samples of two patients are presented who were diagnosed with matching characteristics and grades of breast cancer. Although both patients had a similar prognosis and treatment, only one developed metastases. 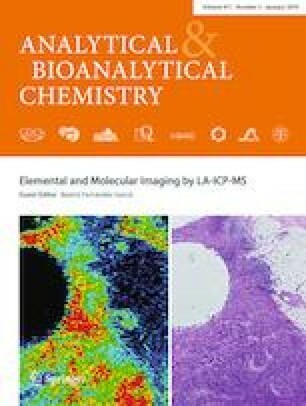 Published in the topical collection Elemental and Molecular Imaging by LA-ICP-MS with guest editor Beatriz Fernández García. The online version of this article ( https://doi.org/10.1007/s00216-018-1365-3) contains supplementary material, which is available to authorized users. This work was support by projects MINECO-17-CTQ2016-79412-P from the Spanish Government co-financed by FEDER programme of the European Union (EU), FC-15-GRUPIN14-092 from Fundación para la Investigación Científica Aplicada y la Tecnología (FICYT) from Principado de Asturias co-financed by EU and PAD is the recipient of an Australian Research Council Discovery Project (DP170100036). The study adheres to national regulations and was approved by the Hospital de Jove Foundation Ethics and Investigation Committee (PI02/2018). All procedures performed in studies involving human participants were in accordance with the ethical standards of the institutional and/or national research committee and with the 1964 Helsinki declaration and its later amendments or comparable ethical standards. Informed consent was obtained from all individual participants included in the study.